Bemidji Leads, a group of engaged and invested community members, has been meeting monthly for 15 years. They meet to create a vision of what they want their community to be, and then they work to make it happen. As former Bemidji State University president Jim Benson says, “They plan from the future.” They are intentional and holistic as well as specific. Broadband is a key component of their plan. Bemidji is home to Paul Bunyan Communications, a member-owned cooperative created (in the 1950s) to bring infrastructure to its members. Today, Paul Bunyan’s purpose remains meeting the telecommunication needs of its owner-members. To this end, Paul Bunyan borrowed $100 million in federal funds to bring the “GigaZone,” a world class Fiber-to-the-Home network, to its members. Besides investing in infrastructure, Paul Bunyan also has been an active partner in community efforts to drive broadband adoption and sophistication of use. The GigaZone is more than the connectivity; it’s a branding message that has caught on both for Paul Bunyan and community. Existing customers want to convert to the GigaZone, and new customers ask for it by name; it makes Beltrami County a more desirable place to live. Communities throughout Minnesota are trying to woo the GigaZone into their areas. Another key asset for promoting the use of broadband and technology in the area is the Launchpad, the local entrepreneur, co-working space and incubator that offers daily and monthly co-working space and ongoing programming including training, mentoring, networking and community planning. The chart above tracks percentage of served population in Beltrami County over time. 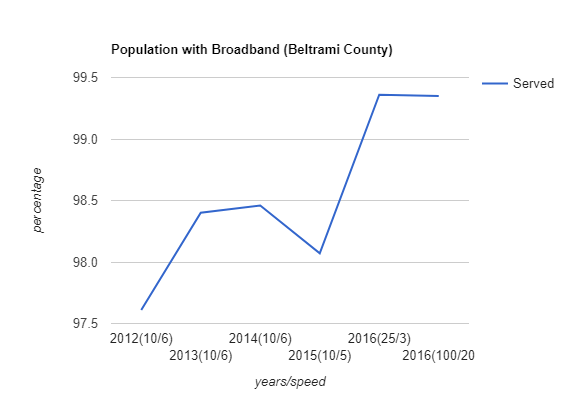 There was an anomaly in 2015 (when the mappers changed how they measured broadband); otherwise Beltrami has seen a steady increase in broadband access and is poised to meet the broadband goals for 2026. How is Beltrami County Doing? We met with representatives from Beltrami County at the Launchpad. In the shadow of Paul Bunyan, they have built a cool technology buzz that has matured enough to see some results. Their intentionality is striking both in the community’s determination to “plan from the future,” and in the provider’s unique marketing of the GigaZone service. Bemidji and Beltrami County are booming. They are a finalist for Best MN Town of 2017. Enrollment at Bemidji State is up for the third year in a row. Twin Cities Business featured Bemdji in its February 2017 edition with a 10-page story entitled Bemidji 2.0, calling Bemidji “a high-speed, regional center of enterprise”. Mike Stittsworth bought his family’s butcher shop, Stittsworth Meats. In 2014, he posted a Facebook status promising a $200 voucher to the person who shared the message the most times. That post went viral. He now has 63,000 Facebook fans, and customers start arriving 15 minutes after he posts a special. People take road trips to visit him; 57 percent of his customers are new. And he doesn’t even sell online – yet. (Refrigerated delivery is the hiccup; he’s working on it.) He is also working on an expansion involving processing local meat. He started with three employees and has plans for 27 full time employees next year. Aircorp Aviation restores WWII aircraft from around the world. They use broadband for promotion, research, to source parts, and for cloud computing. They fabricate parts that are no longer available, which requires sharing large files and real time, remote collaboration. They have developed software for project management and a platform for sharing documentation called the Air Corps Library, which is like Ancestry.com for airplane parts. Like genealogists, aircraft restoration is a passion and Aircorp has visitors from around the world. They get 30-40 requests for tours a month and host an event on Veteran’s Day for 300 people. That means tourism revenue for the community. Aircorp could have located anywhere with broadband. They chose Bemidji because people in the area are good builders. They could not grow the business without broadband. Annual revenue is $4 million; General Manager Erik Hokuf says without fiber that would be more like $300,00-400,000. With broadband they are aiming for $50 million in 10 years. Through their website and reputation, Aircorp has been approached by major airlines with requests to help fabricate parts – which is a major part of the reason why $50 million over 10 years is possible. Broadband on Main Street has allowed small shops to stay in business. We heard that up to 90 percent of sales are online, and 10 percent in the shop. Broadband levels the retail playing field; when a big box retailer moves in they take local money – online local businesses do the opposite. Boutiques are booming in Bemidji. People can make money being niche, appealing to customers both locally and online. Broadband is making healthcare easier. Sanford Health, in Bemidji, is the largest health care provider in the region. They have gone digital. For patients that means access to a healthcare portal for health information and making appointments. It means e-visits, which is a cost-saving convenience that’s growing in popularity. The problem right now for Sanford is that they can’t standardize remote care because not everyone in their service area has access to adequate broadband. Nevertheless, they are looking to add 50 doctors.Recruiting doctors will be easier because they will have a state-of-the-art workplace and broadband access at home, which means their children will have access for education and accompanying spouses will have increased employment opportunities. Paul Bunyan Communications has hosted two highly successful GigaZone Gaming Championships, where teams and individuals won real money for gaming. It was easy to recruit participants, and the events brought tourists to the area. It built a buzz about the community, and will lead techies and future techies to consider Bemidji when they are looking to relocate. Paul Bunyan has seen an increase in intern applications since hosting the event. At Bemidji State University (BSU), 15 to 18 percent of credits are generated online and most classes have some online component. Not being place bound is valuable. Students can attend class from home, the school connects directly with the tribal college for collaboration, and through broadband the school can offer custom classes (such as graduate coursework for teachers) to multiple locations. It reduces costs for the school and the students. And in surveys, students have ranked online classes tops for interaction. An emphasis for BSU in the future is international recruiting. They do about 90 percent of recruiting without leaving the country. Broadband allows communication with recruits and in turn allows new students to stay connected to home as they transition to school.